Traditional and contemporary recordings by Ray Walker, David Slater, and Len Reeves and Dallas choirs. Audio samples. Southern California Catholic and Christian music writers. Links to other independent musicians and songwriters of music for worship and praise. Christian music store online featuring christian music cds, tapes, videos, accompaniment tracks and songbooks at discounted prices and every 7th item ordered is free. Buy, sell, and trade new and used Christian CDs. Buys and sells Christian, family, reading and homeschooling books as well as videos, software and music. Christian music store based in Arkansas featuring accompaniment tapes and CDs, sheet music, educational materials, and bibles. Special orders welcome. Music produced, recorded, published, and distributed by John Tracy, Christian saxophonist. Independent and mainstream Christian music. Specializing in gospel soundtracks, Christian accompaniment music, wedding music, and accompaniment music for all occasions and holidays. Offers alternative music by Hal Richardson. Sound clips and pictures. Gospel and Christian CDs, vinyl, DVDs, videos, and sheet music. Symbolic patriotic American Christian soldiers cross of Jesus necklace. Also offers Christian t-shirts, and gifts. Christian sheet music, videos, and CDs. Underground and out of print Christian music. Downloads of Christian music songs and albums. Sells downloads of Christian music songs and albums. Christian DVD title in many categories that include Christian subject matter. Hawaiian music CDs in styles including Jawaiian, slack key, traditional, contemporary, and Christian. Distributing for independent Christian artists and indie record labels. 26 Menzies, Gary Solo pianist. Solo pianist. Listen to sound clips, order CDs and tapes. Christian hymns and semi-Classical music. Certified music therapist, composer, and performer offering therapy oriented recordings. Includes sale of musical instruments. Christian-themed spirit t-shirts, sweat shirts and shorts. Offering SKS pewter and crystal, nutcrackers by Christian Ulbricht and Erzgebirge Volkunst, smokemen, pyramids, music boxes, Black Forest mantle clocks and hand made Christmas ornaments. New Zealand retailer offers Christian fish rings in sterling silver. It is committed to research, promotion and development of music education, specialising in contemporary music practices including music technology and rock music. Recordings and MP3 samples of Werner Johns music. Rich instrumental arrangements of Early Music, Christmas music, Native American style music. If the business hours of Dallas Christian Sound in may vary on holidays like Valentine’s Day, Washington’s Birthday, St. Patrick’s Day, Easter, Easter eve and Mother’s day. We display standard opening hours and price ranges in our profile site. We recommend to check out raywalker.com/ for further information. 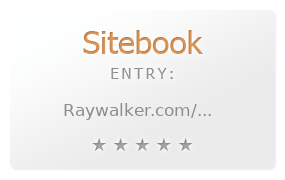 You can also search for Alternatives for raywalker.com/ on our Review Site Sitebook.org All trademarks are the property of their respective owners. If we should delete this entry, please send us a short E-Mail.